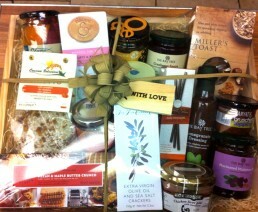 Did you know that the deli makes up wonderful hampers? We can make these up to your requirements or you can choose from a wide range of our most popular ones. Just let us know what you’d like (preferably the day before you need it) and we will have it ready for you. Prices range from £20.00 upwards and there are hampers available for all occasions. These make a great gift for birthdays, anniversaries, Christmas or just to simply say Thank you. We can also make hampers with cheese and/or charcuterie. We also have gift vouchers available!